This thank you card is for a friend who loves cats. Unfortunately, her husband has an allergy to them. Hopefully this mischievous pair will bring a smile to her face! The 6" square Island Indigo card is layered with Soft Sky cardstock and some of the gorgeous Blooms and Bliss DSP. 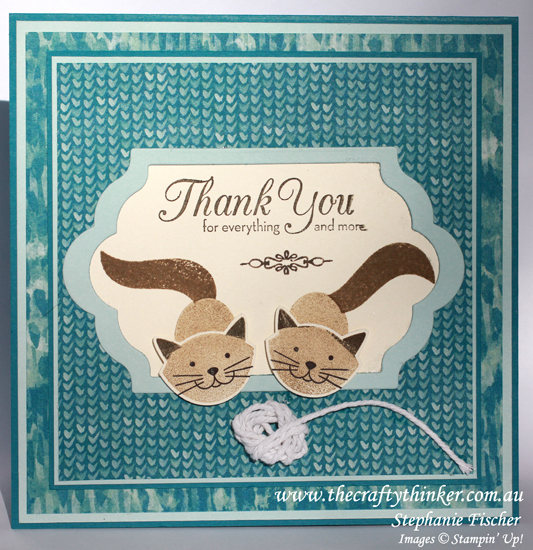 The cat bodies and sentiment are stamped with Soft Suede ink onto Very Vanilla cardstock. The sentiment is from One Big Meaning and the little flourish is part of a stamp in the Banners For You set. I masked the bodies before I stamped the tails. The heads are stamped onto a separate piece of Very Vanilla cardstock and punched out with the matching punch. The bodies and heads are Soft Suede ink stamped off (the ears are then dabbled in Early Espresso ink). The faces are Basic Black and the tails are full strength Soft Suede. I used one of the Lots of Labels framelits to cut an aperture in the top layer of DSP and created a frame for it in Soft Sky cardstock by using the same size framelit and the next size up. I then adhered this layer to the Very Vanilla piece, positioning it around the cats. I stamped the greeting and then adhered all my layers. Once the layers were in place, I added the cats heads with a dimensional. The ball of string is a length of Whisper White Thick Baker's Twine that I wrapped around my fingers. Once I was happy with the shape, I carefully put it on my silicone mat upside down and doused the back with Multipurpose Liquid Glue. I left it to dry for several hours and by the time I wanted to used, it was tacky enough to simply press down onto the card. I used the Fine Tip Glue Pen to add a touch of glue to the tail of the string.